Solid and Firm. They may be original, or reproduction, or the style of, or made by. And including a variety of reasons. Otherwise Wear is usual for its age. This is what gives it its character and confirms its age. We do our best to correctly represent the condition and color of each item in the photos but keep in mind monitor screen colors can differ. Condition: Very good condition with light wear from use. I believe the Needlework is Wool. I don't see any stains on the Butterfly Needlepoint. There are a few small marks on the green velvet. Swivel Stool with Velvet Sides. Very attractive. Cushioning feels very nice. Wear and paint splatter shows it was used often as a step stool and portable work station. This is a early piece that was well made and still very sturdy. Fan over the pictures with your mouse to enlarge view. The seats raise up and down smoothly. The original painted green steel framing have a great look with the natural finished maple seats and backs. They are in very good condition for their age and with the amount of use they have received over the years. Vintage ~ 1950's ~ Chrome w/Vinyl Seat ~ Swivel ~ Bar Stool ~ Clean! 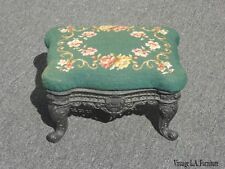 A quality victorian footstool presented in good original antique condition. Rising from elegant tapered legs, displaying. The needlepoint and material is in very good condition. No pulls or wear. your own standards and expectations. Wear is usual for their age. Words used such as Original, or reproduction, or the style of, or made by. And including a variety of reason. This is what gives it it's character and confirms its age. All original finish, hand painted floral decoration, leather top with brass tacks. In very good overall condition. Light scattered dings and wear to legs and corners. Unusual adjustable height drafting chair. Thick wood. Overall nicely designed sturdy chair. Wear to finish, no splits or cracks. Mid century modern design. Has a blue-green paint finish. In very good condition with paint loss, no breaks. This charming Victorian Footstool is covered with traditional needlepoint featuring red roses, violets and foliage on a solid green field. 18 ¼” x 14 ¼” x 3”. Would be perfect for shabby chic, retro, or industrial. This week we have this antique, 19th century American pine footstool. It still has the original green paint, and it looks like the original covering is underneath the needlework cover. It is in solid condition and has a nice petina to the paint. the background color of the needpoint is a soft pink, almost a very light dusty rose color (by more on the pink side than the rose side) It measures 12 1/2" x 10" and is 8" tall. A nice example of an early american pine footstool. Distressed pine farmhouse trestle bench. Perfect for any entryway or dining setting. 72" x 11" x 18". See Pictures. This includes Guam, Virgin Islands, and Puerto Rico. FREE Trial! Solid and Firm. Words used such as Original, or reproduction, or the style of, or made by. And including a variety of reason. Wear is usual for its age. This is what gives it it's character and confirms its age. The overall condition is good, there are a few nicks on the legs from old age, and the fabric is in good condition. 8 1/2" Tall with 12" x 12" Rest Area. Pillow Is Approx. 12" Square and 3 1/2" Thick. Back Rests adjust in 2 directions. Seats are very nice NO issues. Stools adjust correctly. All 3 for one price. On hard plastic casters moves freely. Swivel Mid Century Office Chair. Great Industrial Swivel Office chair. Small push pin loose under head rest. I KNOW, RIGHT.WHO DOES THIS!?. THIS DESIGN IS PATENTED. YOU WILL NEVER SEE ANY BENCH WITH STORAGE OF THIS QUALITY AGAIN. This is for an old HALLOWELL wooden seat. It is wood seat and back rest and the back rest pivots. Seat is covered in green print chenille. Black iron piano stool. Rattan Bamboo Bar Stools Leather Strap. This is what gives it its character and confirms its age.